When last month rumors started circulating about the mysterious project going by the title of Inni (Inside), fans of Sigur Rós went harmlessly insane for a few hours. The most down-to-earth among them perfectly knew what to expect, while others started fantasizing and conjuring all sorts of ideas on Inni being a new album and about what they wished to find in it. 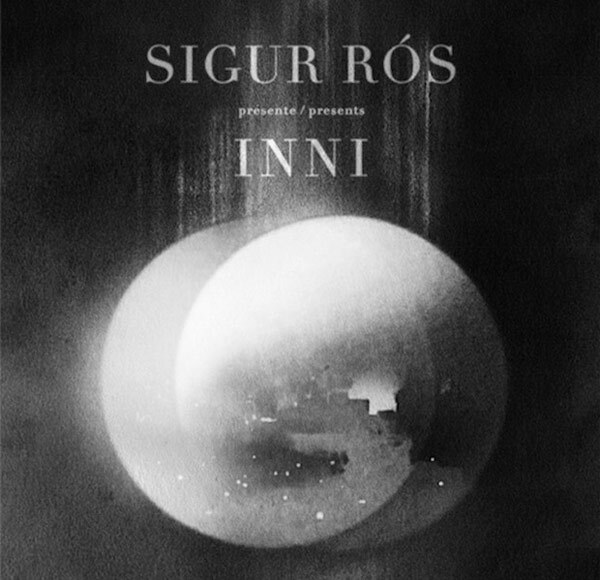 Sigur Rós put an end to all these fantasies soon after, by releasing their teaser trailer, revealing Inni to be a documentary which would be shown at film festivals around the globe before its official release as a double live album and DVD/Blu-ray. Inni, opening film for RIFF 2011, was premiered earlier this month at the 68th edition of Venice Film Festival. To those readers that are not familiar with Sigur Rós and their following, the participation to one of the biggest films events worldwide will serve as an indicator of the extent of the Icelandic band’s popularity. The documentary, directed by Vincent Morisset, was filmed at Alexandra Palace in London, back in November 2008. Morisset is known for having directed another praised music documentary, Miroir Noir, on Arcade Fire (for your information, the specter of Arcade Fire is present at RIFF 2011 in the form of Spike Jonze’s Scenes from the Suburbs). Inni is more than a mere retelling of a two-night concert; it is rather the depiction of the emotional impact Sigur Rós’s live music has on the band’s audience. Inni is a highly sensual film, in the way some multimedia works of art are. The film is intentionally less than visually pleasing, as it breaks some of the common rules that are widely recognized as customary — and thus largely employed — in pop music videos. On the other hand, Inni is highly captivating for its fusion of intense visual and musical elements reduced to their conceptual core. More than following the fetishist route chosen by default by most music video-makers, Morisset chooses the path of abstraction, to suggest rather than to tell. Starting from the original digital material, Morisset transferred Sigur Rós’s performance to the 16mm format; with the help of Karl Lemieux — of Godspeed You! Black Emperor’s fame — he then projected and filmed the footage, applying several unusual filters and processing methods, so that with its stylized traits Inni ended looking both a relic from the past and a gift from the otherworld. 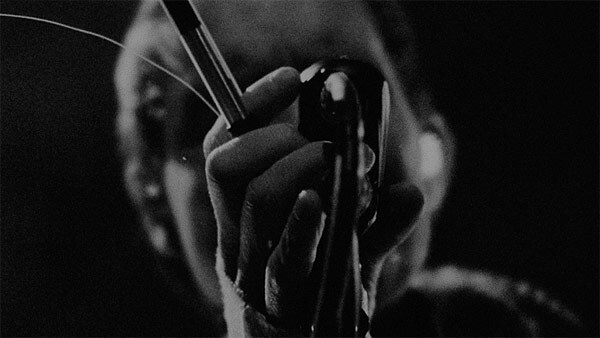 The highly contrasted black and white and the extreme grain complement the film’s eccentric framing, focusing on a sparseness of details and fragments: Jónsi’s glittery cheekbones obscured by a microphone stand, Kjartan’s hands flying over the keyboard, and then guitar strings, unknown faces, shapes, broken spirals of smoke enveloping the stage. The use of negative space, almost swallowing figures and recurring motifs, conveys an overpowering need for introspection. More than simply following the band’s antics, the viewer is forced to internalize the experience, while associating the hypnotizing sound with the enigmatic images. Only breach to this continuity are scraps of older footage, showing much younger Sigur Rós still far from having developed their stage persona. Sigur Rós are not new to the documentary format: their Heima is a beautiful visual account of their connection with their homeland. For its charming atmospheres, Heima has become a cult film and one of the main reasons so many among the band’s fans long to travel to Iceland. Morisset’s take on Sigur Rós is totally different from what fans of the band are mostly used to and it’s impossible to deny that Inni feels like the visual nemesis of Heima. However, fans will also probably agree that rather than opposites, Heima and Inni are both sides to the same spirit. One thing is true: with Sigur Ros you can”t expect a classical musical documentary.I was worried about this new one, after countless visions of “Heima”,but your words are the dissipation of my doubts.Evidently,the music of Sigur Ros is not the best for a realistic approach ,for a MTV approach.”Heima”was an external voyage to Iceland through Sigur Ros music and this new film seems an internal voyage into the dephts of the spectator with the help of the music by Sigur Ros.My only doubt about projects like this: maybe are a long hiatus in the career of a band to fulfill the expectations of the fans, eagers from ANYTHING that comes from her favourite band ,at least this seems to be the only purpose of live albums and live dvds for the most part of groups,and also a way to keep entertained the fans waiting for new songs, new material.However, this new project by Sigur Ros not sems a redundancy. There are always fans that will be pleased with anything and fans that, once they get grumpy, are displeased with anything. I guess a number of fans in this case were genuinely disappointed that Inni wasn’t a new album and others that, even before watching the film, became immediately suspicious. If musicians kept of releasing music following the expectations of fans, they would be repeating themselves forever. I assume it’s good to go on hiatus if you are pursuing other interests/projects or if you feel you have nothing new to say at the moment. As for releasing live material for keeping your following busy, I know this is a touchy subject as musicians have sometimes relied too much on live recordings of previously released songs. Live albums must be done right and in moderation. Sigur Rós have not disappointed so far; Heima was one of the best music documentary I have watched. Although I am not sure the style of Inni goes well with my taste as Heima’s, I am interested in watching it.